Protests broke out at U.C. 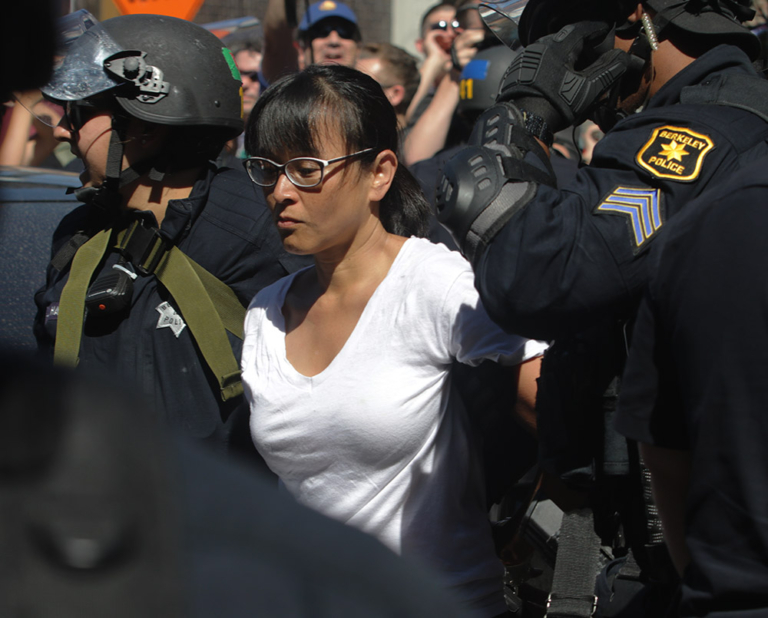 Berkeley Tuesday to shut down Patriot Prayers’ free speech rally, landing at least three protesters in jail, among them prominent “By Any Means Necessary” (BAMN) leader Yvonne Felarca. The planned “Free Speech Week,” scheduled to kick off two days earlier on Sunday and featuring right-wing provocateur Milo Yiannopoulous, was cancelled by student organizers claiming unfair treatment by Berkeley administration. Yiannopoulous echoed the unfair treatment he received from the administration in a Saturday press conference which was recorded at an undisclosed hotel with Pamela Geller and Mike Cernovich, two other headliners for “Free Speech Week.” The Patriot Prayer event came in response to this cancellation. Joey Gibson, the founder of Patriot Prayer, posted a video on Facebook before the event letting fans know he planned the Tuesday rally because he wanted to bring attention to “disgusting things happening at Berkeley,” alluding to the all-too-frequent reminders that the birthplace of the free speech movement is under attack by Progressive Socialist-Fascists vowing to shut down speech and opposing views. Also arrested Tuesday were Eddy Robinson, 47, of Oakland, for participating in a riot and resisting arrest; and Ricky Joseph Monzon, 20, of Las Vegas, charged with carrying a banned weapon. Milo held an “unofficial” rally at Berkeley Sunday, Sept 24, which lasted all of a half hour, reports say. A large crowd of agitators protested Yiannopoulous’ presence, at one point breaking into chants of, “Off our street, Nazi scum.” Felarca is captured on video arguing with police. The LA Times interviewed student David Marquis at the event, who identified himself as a senior. He observed the scene from outside the protest area and told the LA Times he was tired of the protests. He summed up his sentiments to the Los Angeles Times in a few sentences. BUSD said Felarca is a part-time employee who “worked her normal hours” the day of her arrest. No further information was forthcoming.